The Red Sox are now just one game out of last place in the AL East. Stephen (aka #whoneedsDrew) Drew is stinking up the majors slashing just .136/.174/.182 since signing with the Red Sox. Xander Bogaerts is hitting .130/.170/.240 since June 1 and is most likely heading down to Triple-A, because if they are writing about it you are on the way. Jake Peavy has been nothing short of awful this year, with a 1-7 record, 4.82 ERA, given up 17 long balls, has walked 40 over 101 innings against 81 strikeouts. AJ Pierzynski has been fading fast, slashing just .192/.226/.231 and only has three extra base hits since June 1. The depths of the season have been reached this week when they got swept by the Cubs at Fenway Park. Yes, you read that right, the Cubs. Nothing seems to be working for the Red Sox and it would seem the fire sale is in the works. 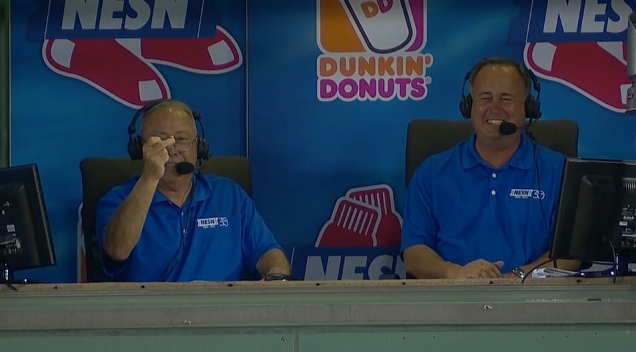 The best thing that happened last night was that NESN game caller Jerry Remy distracted all of us, including a Don Orsillo who could not stop laughing. Here is six minutes that promises to put a spring in your step and a smile on your face for the rest of the day. Do yourself a favor and watch it to the end. Now go and get in on the fun as Jerry's tooth has a twitter account.